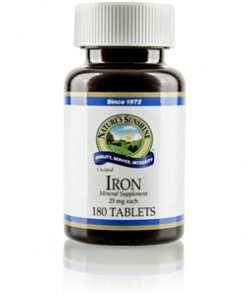 Nature’s Sunshine Iron, Chelated combines an easily-absorbed form of iron with vitamin C, calcium, and a base of rose hips, chickweed herb, mullein leaves, thyme herb and yellow dock root. The body uses iron to produce myoglobin, a substance that provides oxygen for muscle contractions, and hemoglobin. Iron is also a key component in the metabolization of energy. Cellulose (plant fiber), magnesium stearate (vegetable), Rose Hips (Rosa canina), Yellow Dock root (Rumex crispus), Thyme herb (Thymus vulgaris), Mullein leaves (Verbascum thapsus), and Chickweed herb (Stellaria media).